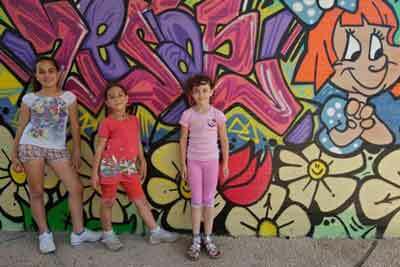 A group of Israeli kids stands near an A4I mural. 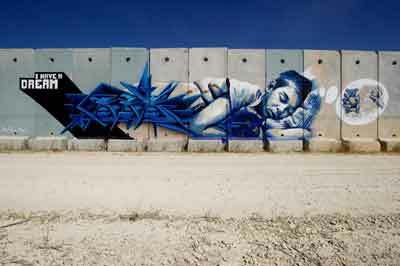 All images courtesy of Artists 4 Israel. Last November, Newark street artist Getlostalot spray-painted his name on the gun of an abandoned Syrian tank in the Golan Heights. Getlostalot who, like many other street artists, prefers to use his street name, or handle, participated in a mission to Israel dubbed Art Over War, sponsored by Artists 4 Israel, a fiercely pro-Israel education, advocacy, social service and artists’-rights organization. The group of eight international and five Israeli artists painted on the walls of the former hospital in Kuneitra, which Syrian troops had turned into a spy base and then destroyed; replaced hate-filled graffiti with messages of reconciliation; and hosted parties for children in Jerusalem and Tel Aviv. Nothing, says Getlostalot, 27, was left bare anywhere the group traveled. Many of the artists posted images on social media of the massive murals they produced, reaching thousands of followers. 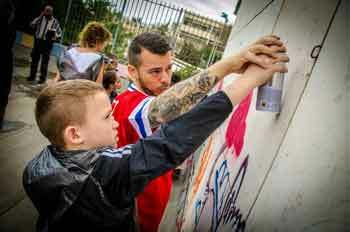 “We do our part to combat violence around the world with a can and a vision,” says Getlostalot, whose handle means “if you get lost a lot you will find something you enjoy on your own without any other influence.” A4I’s goal is similar: It provides artists with the information and experience to make their own decisions about Israel and the Middle East—in effect, hasbara (public relations) through art. Since its founding in 2009, it has organized six trips to Israel and worked with over 6,000 Jewish and non-Jewish artists from around the world in a variety of projects: painting bomb shelters in Sderot and kindergartens on kibbutzim; painting with Ethiopian Yityish “Titi” Aynaw (Miss Israel 2013) and at the Knesset. In the United States, A4I has created murals on college campuses and designed a traveling Bomb Shelter Museum to simulate the experience for non-Israelis. Craig Dershowitz, A4I founder, helps a child get creative with a can of spray paint. “We can’t stop the rockets but we can enhance the quality of life in Israel,” says cofounder and board member Tara Gordon, 31, a writer from New York who fell in love with Israel on a Young Judaea summer trip. An A4I painting on Israel’s security fence. The artists stress that politics is not their agenda—they are participating in a bonding experience for peace, joy and knowledge. “I wasn’t told to go pro-this or pro-that,” says Ski Mst. “We can’t escape politics—but we keep politics out of it,” Gordon says more diplomatically, noting that A4I works with all Israelis—Muslim, Christian and Jew—in all regions. That mission took center stage during operation Protective Edge this past summer. In August, an A4I team distributed 200 Healing Arts Kits at southern kibbutzim and towns and trained professionals in their use. The kits, developed in partnership with art therapists, trauma specialists, artists and teachers, include activities and supplies for parents and children in and out of bomb shelters, such as bubbles, finger puppets, clay and drawing materials. “They are a positive coping distraction that provide comfort and reinforce play, resilience and empowerment,” explains Rena Grosser, 29, a Chicago artist and art therapist and one of the project’s developers. Children from the Manhattan Day School in New York and members of the Birthright Israel Alumni Community helped assemble the kits and sent drawings and messages. Healing Arts Kits include puppets as well as other supplies. The program, which officially launched this October in partnership with WIZO (Women’s International Zionist Organization), grew out of a March 2014 trip with a group of female graffiti artists to celebrate women’s freedoms in Israel. “We were in Ashdod during rocket attacks, and the artists said, ‘Let’s work with the kids to take their minds off it,’” Dershowitz recalls, adding that the concept for the kits was originally promoted by street artist Army of One (Jef Campion, who has since passed away). Dershowitz notes that the trip exposes participants to an array of cultural, social and gender issues. At a Netanya community center with a mixed population of Russian and Ethiopian children, the artists painted the exterior walls with images of Russian nesting dolls and whimsical Ethiopian boys surrounded by people with purple skin tones so as not to represent one culture or another. “There are people of all colors in one small country,” says Gordon. “That’s a side most people don’t see.” On a shed in Ulpanat Dolev, a school for at-risk girls, Spanish artist Belin (Miguel Angel Belinchon Bujes), 35, created a portrait of a brown-eyed girl with long lashes whose race is unclear; she could be any Israeli—Sefardic Jew, Ethiopian, Arab. The teachers encouraged the girls to use the image as a model for being strong and proud, says Dershowitz. Outside israel, a4i’s successes range from bringing pro-Israel artists to Art Basel, the world’s second-largest art fair, to selling out a series of Off-Broadway plays. Recently, it cosponsored the inaugural Szyk Prize of Disruptive Thought and Zionist Art (awarded to Israeli artist Tomer Peretz). Some of the artists who visited Israel now travel to college campuses to engage American students in dialogue and art. Recently transplanted from New York to Los Angeles, Dershowitz was raised in a Reform home in Brooklyn. At an early age, he confronted the “Israel question” through books like Jewish Defense League founder Meir Kahane’s Uncomfortable Questions for Comfortable Jews (Lyle Stuart). He heard stories of the African-American struggle for independence and freedom from his neighbors and learned that they used the arts to liberate themselves from oppression and discrimination.